One of the first areas of the face to exhibit signs of aging is the area around the eyes. Under-eye bags and sagging upper eyelids that come with age can be corrected through cosmetic eyelid surgery, also known as blepharoplasty. This relatively minor cosmetic surgery procedure can refresh the appearance of the face and leave it looking years younger. Use the information provided below to learn more about eyelid surgery cost, benefits, and potential risks. Q. What is Blepharoplasty ? Changes in the eye lid caused by droopy or saggy skin as well as bags around the eye can be corrected by eye lid surgery or blepharoplasty. Upper and lower eye lid can be corrected simultaneously and the procedure rejuvenates the eye. Protruding fat and excess skin can be addressed simultaneously by excision. 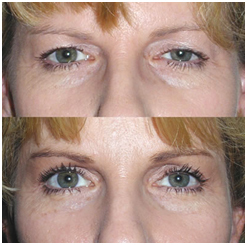 Eyelid surgery, or blepharoplasty (BLEF-uh-ro-plas-te), repairs droopy eyelids by removing excess skin, muscle and fat. To help decide if this surgery is right for you, find out what you can realistically expect and explore the benefits and risks involved.Many patients combine blepharoplasty with other treatments such as brow lift to eliminate drooping eyebrows, and various cosmetic dermal fillers to treat crow's feet. Before undergoing blepharoplasty, or any other surgical procedure for that matter, you may experience a certain level of nervousness. This is a perfectly normal way to feel leading up to a surgery. There are, however, ways to physically and emotionally prepare for eyelid surgery that will help make for as comfortable and successful a procedure as possible. In lower eyelid surgery, the surgeon makes the incision in an inconspicuous site along the lashline and smile creases of the lower lid. Excess fat, muscle, and skin are then trimmed away before the incision is closed with fine sutures. Eyelid puffiness caused primarily by excess fat may be corrected by a transconjunctival blepharoplasty. The incision in this case is made inside the lower eyelid, and excess fatty material is removed. When sutures are used to close this kind of incision, they are invisible to the eye. They are also self-dissolving and leave no visible scar. Under normal conditions, blepharoplasty can take from one to two hours. Asian eyelid surgery is a type of plastic surgery that has become a popular option to counter a common condition found in about 50 percent of people of East Asian descent: a lack of a fold in the upper eyelid. The absence of an upper eyelid fold leads to the appearance of droopy eyelids and smaller eyes. Asian eyelid surgery creates a fold to make the eyes look larger and rounder. Figure : Top: Eyelid area, before blepharoplasty. Blepharoplasty , like any other surgical procedure, carries both risks and benefits. Cosmetic eyelid surgery places the patient at risk of general surgical complications like swelling, infection, and bleeding. Various side effects can also occur after the surgery. However, the benefits that eyelid surgery affords, like an enhanced appearance and improvement in sight for those with extremely droopy eyelids, are long-lasting and can be life-changing. Due to scar contraction, rarely there is pulling of lid downwards called ectropion. Dryness of eyes and visible scarring are rare. The results of blepharoplasty surgery are typically long-lasting and very satisfying for the patient. When patients have realistic expectations going into surgery and closely follow their surgeon's instructions for recovery, cosmetic eyelid surgery can be a very successful and fulfilling procedure. Though blepharoplasty is commonly thought of as a procedure for women, its popularity has been growing among men. Cosmetic eyelid surgery offers men the same benefits as it does women - improved sight, the appearance of bigger eyes, and elimination of unsightly bags. Male eyelid surgery can be a very beneficial procedure for men who qualify as good candidates.